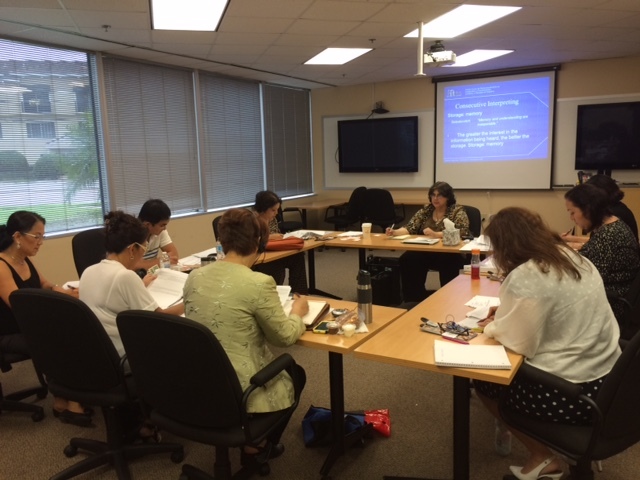 November 23, 2015: Clarivita Language Services in partnership with esteemed Federally Certified Court Interpreter and Trainer, Maria Cecilia Marty-Martinez, launched the Elite Court Interpreter Workshop series on November 20th in Tampa, Florida. 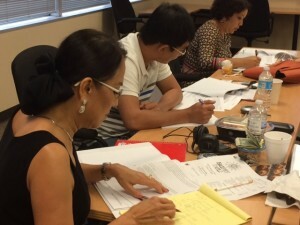 Students, who were both aspiring and experienced language interpreters representing several languages including Spanish, Vietnamese, Mandarin, and Japanese, had traveled from throughout Florida and Georgia to attend the break-through workshop designed to provide the most technique-focused court interpreter training experience available in a 1 – day intensive course. Florida’s LEP (Limited English Proficiency) population continues to grow at a rapid pace. In April 2015 the State of Florida announced that by October 1st, 2015, the Florida State Courts will require a CERTIFIED INTERPRETER in all legal procedures whenever possible when an LEP plaintiff or defendant is involved. These instances include any proceedings presided by a state court judge, general magistrate, special magistrate, or hearing officer within the court system … As well as depositions, mediations, arbitrations, examinations under oath, etc. and for which the primary purpose is the communication or exchange of information related to a claim or defense in or the settlement of a pending or impending court case. “With only about 200 Certified Spanish Interpreters in the State of Florida there is a clear need to bring more certified interpreters on board to serve our LEP residents and ensure Due Process. However fewer than 30% of interpreter candidates actually pass the State’s examination process”, said Cy Cawthorn, Clarivita’s Director of Business Development & Operations. Clarivita Language Services plans to launch several more training courses in early 2016. Transcription and Translation of Forensic Recordings will be offered to both enterprise clients such as the FBI, as well as individual linguists. Other courses, including Advanced Simultaneous Interpreting Techniques, will be offered via live-classroom and online webinars. Most courses will provide continuing education credits to Certified Interpreters. Clarivita will also be launching training courses specifically for enterprise Healthcare clients to train bilingual Staff on Medical Interpreting Techniques, Ethics and Protocol. In addition to Interpreter Training, Clarivita’s language access solutions include Healthcare Interpreting Services, Legal Interpreting Services, Document Translations, and Voice-over / Dubbing Services.